We're honored to announce that we have received the Bronze Bar & Shield award for 2018! We want to extend a huge thank you to each and every one of our customers for their loyalty and support of Yellowstone Harley-Davidson. Our customers are a big reason why we consider ourselves one of the best Harley-Davidson dealerships in Montana and in the United States. Read a quick press release from HDMC about the award below! Yellowstone Harley-Davidson earned the prestigious Bronze Bar & Shield Circle of Recognition Award for 2018. Presented by Harley-Davidson Motor Company, this award is given to dealers based on motorcycle and related product sales performance, customer service and satisfaction, and operational measures. Bronze Bar & Shield award recipients, like Yellowstone Harley-Davidson, consistently elevate the brand by providing their customers with exceptional and authentic Harley-Davidson experiences. Yellowstone Harley-Davidson, 540 Alaska Frontage Road, has been in business in the Belgrade area since 1987. 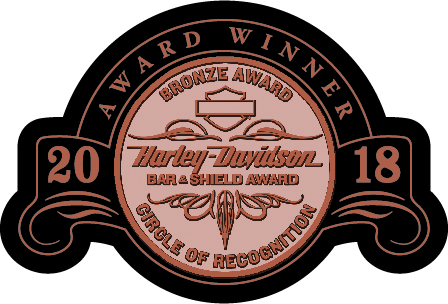 This is Yellowstone Harley-Davidson’s 11th Bar & Shield award."